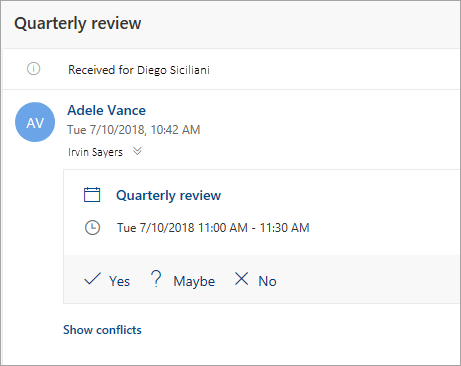 With the right permission, you can use Outlook on the web to edit other people's calendars and even send and respond to meeting requests on their behalf. Before you can edit someone else's calendar, they have to give you permission by sharing their calendar. They can follow the instructions at Calendar delegation in Outlook one the web for business to learn how. As an editor, you can create or edit events on the calendar. As a delegate, you can also respond to meeting invitations on the calendar owner's behalf. The calendar owner can also choose to give delegates access to private events. 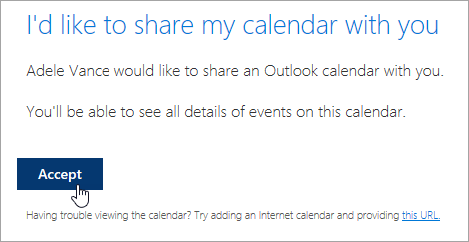 Note: It's not possible to use Outlook Calendar to request permission to someone else's calendar. 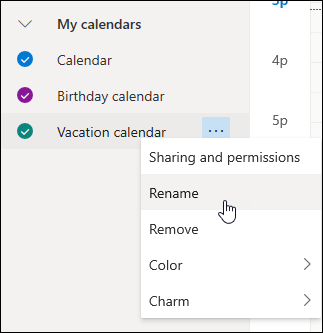 If you’ve received an invitation to share someone else’s calendar, select the Accept button in the invitation to add it to your list of calendars. Invitations in some Outlook applications will not have an Accept button. If you do not see an Accept button﻿, use Outlook on the web to accept. Invitations might not be sent at all from some Outlook applications. 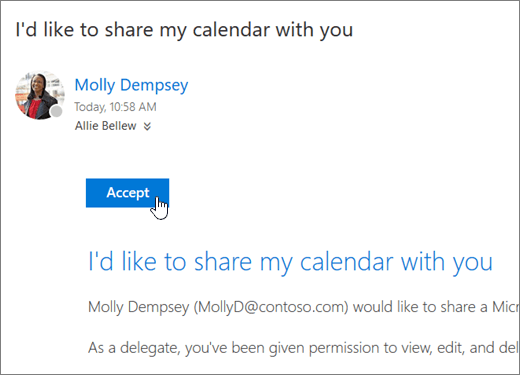 If you did not receive a sharing invitation email, ask the calendar owner to share the calendar again from Outlook on the web. 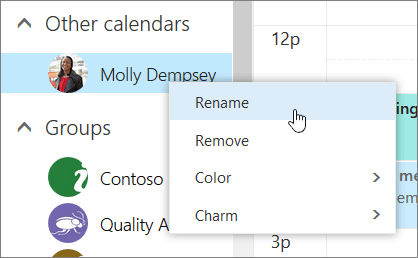 After you’ve added a calendar, you can select it to add it to or remove it from your calendar view, or use the context menu to rename it, change its color, or delete it from your view. Once you have editor or delegate access to someone else's calendar and have added it to your calendar list, you can schedule meetings on their behalf. It's just like setting up a meeting on your own calendar, but you choose their calendar when creating the meeting. When you send the meeting invitation, it will show that it's from you on the calendar owner's behalf. In Outlook on the web, select at the bottom of the page. Make sure that you can see their calendar in your list of calendars. If you can't, see the above section about adding someone else's calendar to your calendar view. Select New event at the top or double-click on the calendar area to open a new calendar item form. In the Save to calendar field, select their calendar. You will only see calendars that are added to your calendar list and for which you have editor or delegate permissions. Fill out the rest of the fields as needed. Using the Scheduling Assistant can make it much easier to set up a meeting. If you want to add an appointment to someone else's calendar, follow the steps above to select the other person's calendar but do not add any additional people to the meeting. The event will be added to the other person's calendar but no meeting invitation will be sent. If you're a delegate for someone, meeting requests and updates will be sent to you. They'll show up in your Inbox just like any other meeting request, but you'll see a note on the meeting form that tells you who the meeting request is for. Select Yes, Maybe, or No. Select the Notify organizer toggle if you would like to let the organizer know your response. You can add a message to your response. If you accept the invitation, the meeting will show as busy on the owner's calendar. If you choose to send a response, the meeting organizer will see that the response is from you on the calendar owner's behalf. 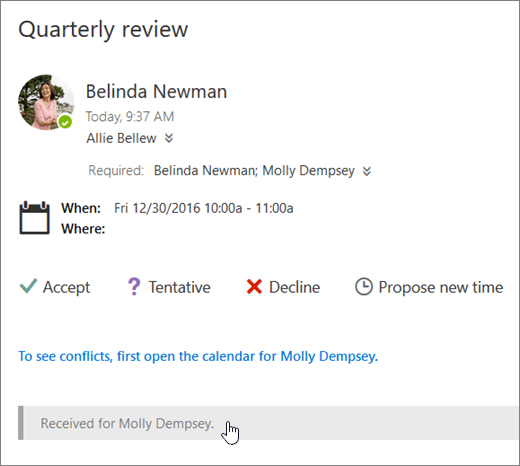 Note: If the person who owns the calendar is using Outlook on the web, they won't see in their Inbox that you've responded to a meeting invitation on their behalf. If they view their calendar, they'll be able to see the event and if you (or another delegate) have responded to it. As a delegate, you can also edit or cancel meetings on behalf of the calendar owner. To do so, open the calendar event, make the changes, and select the option to send the updated or canceled meeting invitation. The meeting update or cancellation will be sent from you on behalf of the calendar owner. Note: Once a meeting invitation has been sent, you cannot change the calendar on which it was scheduled. At the top of the page, select the app launcher , and select Calendar. 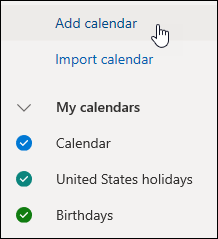 Select New at the top or double-click on the calendar area to open a new calendar item form. Select Accept, Tentative, or Decline. Send a response if you would like to let the organizer know your response. 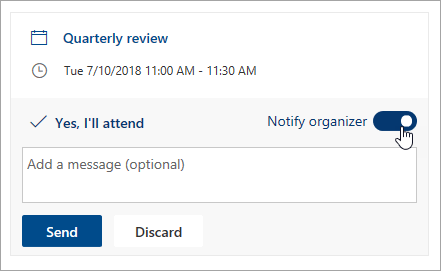 The calendar owner does not receive a notification when you respond to a meeting invitation, but he or she can see that the event has been responded to when viewing the event in his or her calendar view.